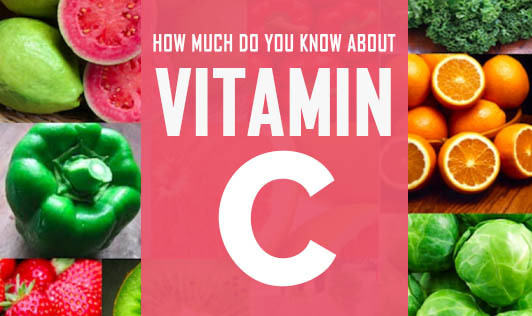 How Much Do You Know About Vitamin C? Vitamin C or ascorbic acid is a widely known nutrient. It is mainly known for its antioxidant property and it plays a major role in prevention of degenerative diseases like cardiovascular diseases, hypertension, diabetes, cancer etc. • Strengthening the immune system by increasing T-Cells, Macrophages or leucocytes count against bacterial and viral infections. • It helps in healing wounds, improving the health of gums and skin. • It helps in the absorption of vitamins like B-complex, Vitamins A & D.
• For better absorption and utilization of iron to improve hemoglobin levels. • For improving sperm count, sperm motility and hence, improve fertility. How much of Vitamin C should one consume to avail these benefits? Different dosages are required for various benefits. One glass of orange juice cannot supply all the vitamin C needed to offer protection against heart disease and cancer. A complete eradication of free radicals can be accomplished only with additional supplements. A doctor can help in deciding the dosage of the supplement required. Vitamin C also protects against all forms of radiations like X-Rays and UV-Rays. About 2 gram per day has shown to protect the bronchial airways and lungs from cold temperatures and air pollutants. If a person with diabetes consumes vitamin C as required, it can prevent him/her from further damage to the body and also curb the elevation of blood sugar levels. The rich sources of vitamin C include all green leafy vegetables like coriander leaves, drumstick leaves and cabbage, other vegetables like capsicum, drumsticks and green chilies, fruits like guava, amla, lime and oranges. Vitamin C can be taken throughout, within prescribed time limits to help the body tissues maintain optimal levels. Lastly, utmost care should be taken during preparation of food to prevent the undue loss of this precious nutrient. • Always use fresh fruits and vegetables. • Wash and cut, and never expose cut fruits to air for longer periods. • Do not use high temperatures for cooking. Talk to your dietitian to know the best way to achieve maximum r absorption of Vitamin C. Use food sources of vitamin C in your daily food routine to stay healthy and fit. You can go to "tools --> request appointment" to talk to your dietitian.